The events of the Broken Shore were hard hitting to say the least. 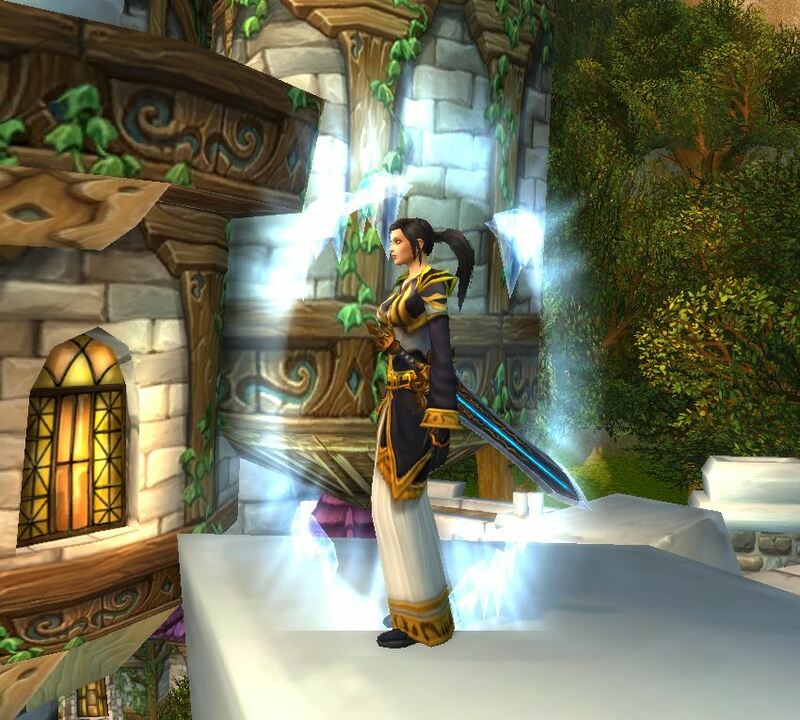 And while I was a crumpled ball of feels for the most part, the real sense of loss came differently when I logged into my human mage – my only human character. In light of everything, my character felt the need to express her loss and mourning in her outfit. Thus we have an outfit built around Black Ash Robe – a stately yet subdued, dignified robe that my mage adorns for respect for her king. Chest: Black Ash Robe (Firemaw, Blackwing Lair). Shoulders: Faerie Mantle (Obtained from the quest “The Branch of Cenarius” in Ashenvale). Waist: Brantwood Sash/Akama’s Sash (The Brantwood Sash is no longer available – so Akama’s Sash is your best bet. It is a quest reward from the quest “” in Shadowmoon Valley (Burning Crusade)). Hands: Fel-Infused Grips (Pre-launch Legion Invasion events). Feet: Veteran’s Mooncloth Slippers (PvP vendor, Area 52 Netherstorm). Off-hand: Lantern of Enchanted Flame (Obtained from the quest “Valduran the Stormborn“, Storm Peaks). A sword for vengeance, and a lantern for hope. 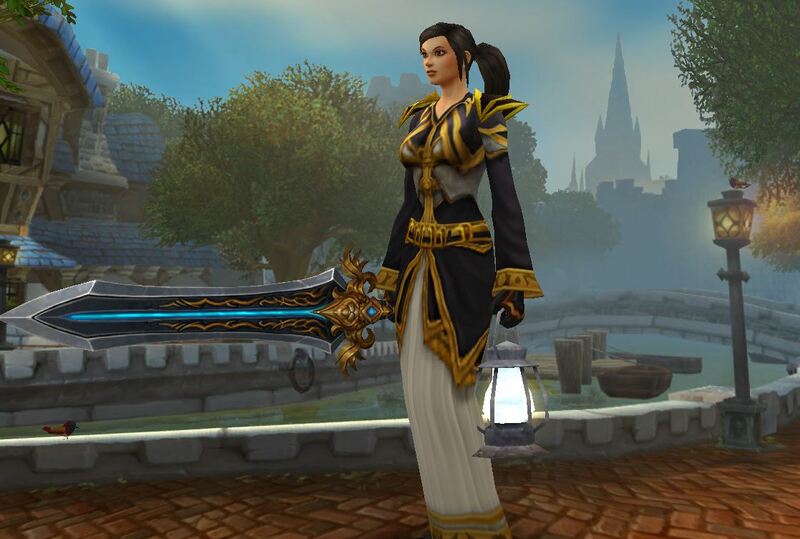 I wanted to have a weapon that was a nod to the Alliance and there was no better sword than the Lion’s Fang. I love the detail and golden lion at the hilt. Watch out Gul’dan! I’m coming for you…and yes, you should be very afraid. That is a beautiful and very fitting kit (and reminds me that I need to go farm up that robe). Thanks! It’s my favourite robe in that style. I too need to revisit BWL. 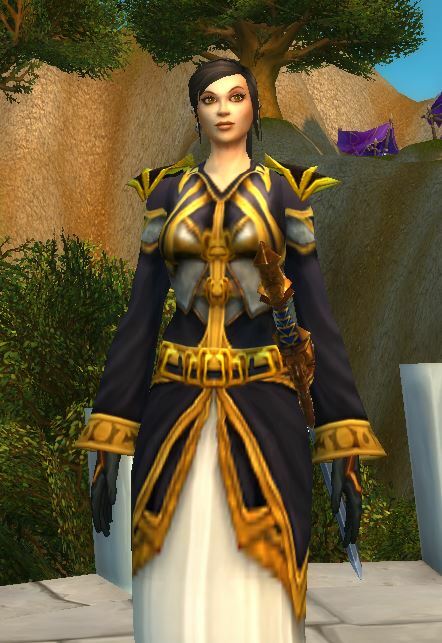 When I think of some of the awful cloth robes I kept, I can’t imagine why I got rid of this one.